Pacific Breast Care Center has one of the most advanced magnetic resonance imaging (MRI) devices available in Orange County and the surrounding region. Our Siemens Magnetom® Espree 1.5 Tesla magnet can take high-resolution images in a matter of minutes — without radiation exposure. Its spacious design allows patients of varying sizes to be examined in comfort. It also is ideal for people who are concerned about being in tight, closed spaces. Our breast MRI is exceptional for both screening and diagnostic breast evaluations. A screening breast MRI is typically performed on women who are at higher risk for developing breast cancer. This generally includes people with a strong family history of breast, ovarian and certain other cancers. It also includes patients who have had a prior breast biopsy with a finding of abnormal cells, which have a higher risk of becoming cancerous over time. We perform an in-depth risk evaluation on all of our patients, using the most up-to-date computer risk assessment tool available. This enables us to accurately identify candidates for a screening breast MRI. We also use this highly sensitive technology to perform MRI-guided needle biopsies with exceptional precision. The MRI allows our physicians to identify and target breast abnormalities for biopsy that may not be detected with standard mammography or ultrasound technology. Our physicians and staff members take great pride in our ability to provide a comfortable and friendly environment for our patients during an MRI-guided biopsy. The entire procedure usually takes 30-45 minutes, most of which is imaging time. The actual biopsy process takes only a few seconds. Because of the preparation time needed, this procedure requires advance scheduling. Biopsy results are usually received within two business days. Our physicians are available by phone should you have any concerns following a biopsy. 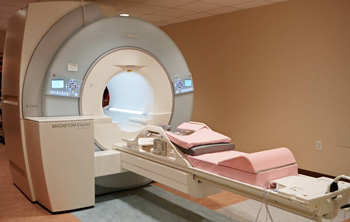 For more information on our MRI and other imaging procedures, please call us at 949-515-3544.